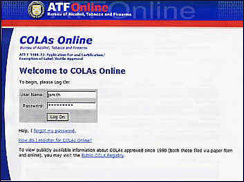 TTB/ATF has developed COLAs Online since about 2003. It is an all-electronic system for processing labels, compared to the paper-based system in place for at least 50 years before. The new system can be quicker than paper. Lehrman Beverage Law, PLLC is committed to ensuring that the new and old systems will work well for you. An overview of COLAs Online is here and a FAQ is here. We can make COLAs Online work better for you, because we know the rules. TTB has lots of rules (for using COLAs Online, in the CFR, at ttb.gov, unwritten, in the Beverage Alcohol Manual, etc. ), and it can be difficult to get an optimal result unless you know many of these COLAs Online prototype screenrules. The internet makes it faster and easier for TTB to approve labels — and to reject them. To demonstrate the benefits of COLAs Online, we are pleased to offer you two complimentary submissions. There is no fee and no obligation. To accept this offer, submit legible labels to colaserver@bevlaw.com. We will promptly submit your labels to TTB in the proper format and keep you informed. Have an experienced attorney review your label before submission and alert you to any substantial complications. Prepare the electronic application in accord with TTB/ATF rules. Convert your labels into a form and format allowed by TTB/ATF. Submit your labels to TTB/ATF within a day of receipt. Notify you about the result within a day after TTB/ATF acts. Protect the confidentiality of your work and archive the approvals to CD (upon request, as an added protection). Submit legible labels by fax, mail, expedited mail, or e-mail (colaserver@bevlaw.com). E-mail leads to the best results. Grant a power of attorney under TTB Form 5000.8. On this form, please complete items 12 and 13, then return to this office in duplicate. Provide a copy of your TTB/ATF permit. This offer is good for up to two label submissions per permit. We guarantee to comply with the above Commitments. There is no guarantee that TTB/ATF will approve your label. If the product requires a formula or other Pre-COLA Approval you must provide a copy. We would be happy to explain the relevant rules and regulations, to seek expedited approval (in as few as 48 hours), advocate approval of your label, or seek a use-up, but these services are not included in this complimentary offer and are available for a fee upon request.